Nurses are attempting to save the lives of cancer patients when administering chemotherapy drugs, but how how do these treatments affect the nurses administering treatment? A study from 2011 found that nearly 17% of nurses were unintentionally exposed to toxic chemotherapy drugs through skin or eye contact while working in an outpatient facility. Less severe side effects include nausea and rashes, but there is also a risk of immediate nervous system damage or chronic conditions such as organ failure if the individual is repeatedly exposed to the chemicals over a period of time. Understaffing and nurse shortages are correlated with accidental chemical exposure, as studies found that nurses working in facilities with fewer staff members and more limited resources were the most often affected. A study from the University of Michigan's nursing school found that nearly 1 in 5 nurses have experienced unsafe exposure to chemotherapy drugs. 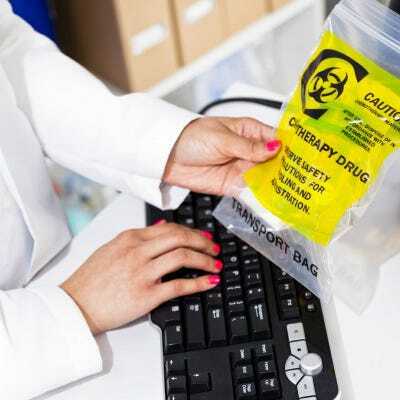 With concrete evidence of the long-term effects of chemotherapy drug exposure on nurses has motivated hospitals to take proactive measures to reduce the issue. Generally speaking, establishing procedures for more careful regulation, safety protocols for when errors do occur, and providing proper protective equipment are all ways that hospitals can lessen the chances of unintended chemotherapy drug exposure. It is important to recognize that chemotherapy drugs are not the problem. These are lifesaving drugs that prolong the lives of many cancer patients. The root of the issue is not the chemicals involved - it is the improper handling of them. Many nurses will find themselves administering chemotherapy drugs at some point in their career, but with the proper protocols in place accidental exposure to the chemicals can be safely avoided.